Logging contractors being left behind in the recovery? While the forest industry has recovered from the downturn—though the recovery still seems tentative, at times—the logging contractor sector seems to have been left behind when it comes to improved logging rates. What gives? B.C. coastal logger Bob Lee has had to change gears with his logging operations in recent years, and this involved some big time changes, with a move to second growth wood, and purchasing and operating bunchers and processors. The new John Deere 748L skidder is helping Alberta logging operation Forest Trotter Contracting be more productive, especially on hilly ground—and offers more operator comfort, to boot. B.C.’s Southcoast Reman, a large custom lumber remanufacturer and kiln drying operation, is making use of an advanced new kiln control system that is delivering impressive savings on their power costs—in the neighborhood of 30 to 40 per cent. Constraints are a fact of life with forestry operations on Haida Gwaii, off the north coast of B.C., but Haida-owned Taan Forest has an initiative underway that would see primary manufacturing of logs from its FSC certified forest operations. 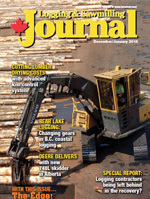 B.C.’s McLeod Lake Indian Band is now involved in sawmilling, through Duz Cho Forest Products, and it has taken an interesting approach with an “inside/out” design for its cant mill, which is creating higher valued products from raw material that other potential users don’t want—or can’t economically use. Registered Professional Forester Melinda Morben has had a successful career in the forest industry—having started out operating logging equipment in the B.C. Interior—and she is now encouraging more women to look at working in the forest industry. Tony Kryzanowski says it’s time to compensate logging contractors on what it costs to run a business in 2015—not in 2008. Manufacturers of thermo-modified wood (torrefied wood) have recently formed a group within the Quebec Forest Industry Council (QFIC) in order to develop and implement a classification standard for their products. This work is being carried out in co-operation with FPInnovations, Cecobois, QFIC and Formabois. Thermo-modified wood is different from wood in its natural state. In fact, wood that is heated at a high temperature alters the main constituents of wood, such as hemicellulose and lignin. The crystalline structure of cellulose may also be slightly modified, in both its physical and mechanical properties. The main resulting advantages after treatment are an improvement in dimensional stability, an increase in resistance to fungal degradation and the creation of new, attractive colours of the material. Moreover, based on the findings of studies on this topic, the stiffness of the wood is not significantly reduced in the process; however, it is a known fact that compared to non-modified wood, modulus of rupture and resistance to impact are diminished. And that is why the use of thermo-modified wood for the structures of buildings is not recommended. And lastly, such wood also has less resistance to abrasion following treatment. Modification of the properties of wood depends on the temperature during treatment. The treatment schedule must therefore be carefully adjusted according to the final planned use of the product. In the past, a number of experiments proved disappointing, as the performance of the product failed to meet expectations. Classification of thermo-modified wood into various categories is therefore well justified. In fact, a classification grid based on the properties of the material will help consumers make a wise choice for their planned use of this wood (e.g., siding, patio, fence, panelling, furniture and other indoor and outdoor uses). For more information in this regard, please contact Carl Tremblay, researcher at FPInnovations, at carl.tremblay@fpinnovations.ca. “The timing, although not planned, couldn’t have been better,” says Steve Price, CEO of AI Bio. Price says the very successful conference, with more than 260 participants at its inaugural event, will be an annual international event co-hosted by AI Bio, aimed at highlighting Alberta and its bioindustrial opportunities. The three-day gathering attracted participants from across North America. In addition, there were participants from Europe, South America, Asia and Australia. It featured presentations from Alberta companies engaged in commercial bioindustrial enterprises, updates on projects supported by AI Bio such as ongoing development of the Biomass Resource Information Management System (BRIMS), and knowledge exchange among researchers sharing their findings on a variety of biomass characterization and conversion projects. As one of four members of the province’s Alberta Innovates family of funding agencies operating at arm’s length from government, AI Bio provides financial support for many of these endeavors. Knowledge extension is a key component of Alberta Bio Future, AI Bio’s bioindustrial program. Price says the government asked AI Bio to host an international conference that would help advance knowledge and growth of the bioeconomy. Working with BCN was a natural partnership, given the excellent relationship that AI Bio has built with the organization over the past six years. Based at the University of Alberta, BCN receives funding from AI Bio to support research communities and create partnerships with industry in the areas of biorefining and biomass conversion technologies. AI Bio’s role is to partner with the province’s forestry and agriculture industries to encourage their greater participation in the bioindustrial sector, add value to agriculture and forestry biomass, and help companies advance to the commercial stage. Alberta’s forest industry was well represented at the conference, among both participants and presenters. Eddie Peace, bioproducts coordinator at West Fraser, provided information on the company’s new lignin extraction plant in Hinton, Alberta. Peace spoke on how the company is working hard to find avenues to add value to lignin. AI Bio helped West Fraser make the leap to full commercialization through support from its Advanced Materials and Chemicals Program. Ron Reis, senior vice-president for pulp at Millar Western Forest Products Ltd., also participated in a featured panel presentation, on creating industry partnerships. He provided an update on the company’s bioenergy effluent project, which will use anaerobic digestion technology to produce biogas from the waste stream at the company’s bleached chemi-thermo-mechanical (BCTMP) pulp mill in Whitecourt, Alberta. The biogas will be used as fuel to generate 5.2 megawatts of power for the pulp mill. Reis said Millar Western has developed an important relationship with Alberta Innovates, working in particular with AI Bio’s sister organization, Alberta Innovates Technology Futures (AITF). As well as running studies in the AITF pilot plant on the anaerobic processes employed in its bioenergy project, Millar Western has partnered with AITF on previous initiatives, such as investigating the use of pulp mill sludge as organic fertilizer for area farmers. AITF was a sponsor and active participant at the conference. The conference also had an outward focus with a feature panel titled “The International Marketplace for Bio-Based Products.” James Lee, director of commercialization at Bioindustrial Innovation Canada (BIC) was among the presenters. The focus at BIC is to help Canada become a globally recognized leader in taking sustainable feedstock, such as agricultural and forestry byproducts and wastes, and turning these renewable resources into energy and value-added chemicals. Lee said he has noticed a positive momentum in knowledge and acceptance of bioproducts globally, particularly when consumers are given comparable “green” product choices, and more industrial sector leaders are choosing more environmentally friendly, sustainable alternatives. 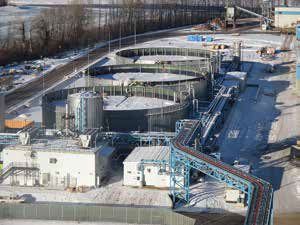 The Millar Western anaerobic digester and biogas power production facility at the company’s pulp mill in Whitecourt, Alberta will come on stream this spring. For more information about the conference, contact Julia Necheff, Alberta Innovates Bio Solutions, at julia.necheff@albertainnovates.ca. Over the past decade, the Canadian Wood Fibre Centre (CWFC) has established a highly successful collaboration with the University of Guelph as part of its Short Rotation Woody Crop (SRWC) National Network of Sites, showcasing short rotation woody biomass options in Canada. The fruits of this successful partnership between CWFC and the university were showcased recently during the SRWC Systems Development Field Days held at the 22-hectare demonstration site located at the Ontario university. The site consists of a variety of afforestation and agroforestry biomass research trials, which presented a unique opportunity during the workshop to discuss the benefits and shortcomings of each in one location. The over 60 participants—consisting of landowners, commercial and industrial end-users, and government representatives in attendance—enjoyed presentations from SRWC specialists from CWFC and researchers from the Canadian Forest Service, University of Guelph and BIOFUELNET Canada. Among the topics discussed were SRWC and agro-forestry biomass options, plantation establishment and management methods, growth and yield expectations, carbon sequestration and nutrient implications, and potential markets for woody and agroforestry biomass. A highlight of the event was a demonstration of two proven purpose-built, and Canadian-made woody biomass crop harvesting systems. The active demonstrations showcased the Anderson Bio-baler and Gyro-Trac BBS woody biomass harvesting and baling systems. Attendees were able to evaluate each machine operating in three-year old willow and hybrid poplar plantations. The University of Guelph site demonstrates best practices for establishing short rotation woody crops and management options suited primarily for Ontario and eastern Canada as a whole. Keddy adds that the growing conditions, especially the soil, climate, and the fact that the water table is close to the surface, are very different than the CWFC research sites in western Canada. 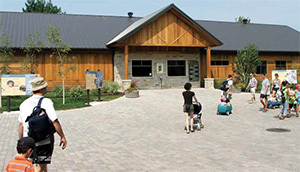 “The investment made by CWFC since 2005 in setting up potential management regimes related to the production of woody biomass at the University of Guelph research site has received recognition and appreciation from landowners, non-governmental organizations, and federal and provincial ministries,” said Dr. Naresh Thevathasan, Research Manager and Adjunct Professor at the University of Guelph, School of Environmental Sciences. He added that six local and international graduate students, as well as 500 undergraduate students, have benefited from this collaboration. Aerial view of the University of Guelph Short Rotation Wood Crop site during a recent Field Day event shows the variety of agroforestry options being demonstrated by CWFC at the site. The Guelph Field Day event attracted biomass end users, government representatives, and researchers, celebrating the decade-long relationship that CWFC has developed with the University of Guelph. For more information about the University Of Guelph demonstration site and CWFC’s short rotation woody crop program, contact CWFC Wood Fibre Development Specialist Tim Keddy at tkeddy@NRCan-RNCan.gc.ca or Derek Sidders at Derek. Sidders@NRCan-RNCan.gc.ca. Presentations made at the workshop can be viewed at http://www.biofuelnet.ca/news-and-events/short-rotation-crop-systems-development-field-days/. 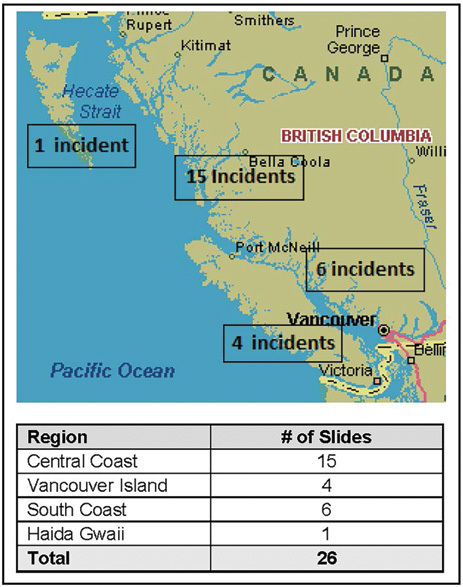 Road construction-initiated landslides have been a persistent issue on the coast of British Columbia and, to a lesser degree, within other areas of the province. According to recently collected data, there have been 26 such incidents on the coast over the last three years. Nine of these incidents involved excavators sliding down the slope from the road prism during road construction activities. The incidents have been very serious in nature with considerable human, environmental and operational costs. Fortunately, we have seen no fatalities to date but both physical injuries and physiological impacts have been common. Some groups have developed partial solutions to the issue, but there has not been a united front across the industry to address the problem. On October 7, 2014, an informal group of industry, government and consulting practitioners met to explore the issue. The meeting was sponsored by BCTS (BC Timber Sales). One of the actions stemming from the meeting was the formation of a working group that is supported by the Coastal Harvesting Advisory Group (CHAG). A formal proposal based on this action was provided to CHAG and support was confirmed in December 2014. The working group will focus on B.C. coastal road construction, but will pass on information to all interested B.C. Interior parties. The group has developed a short- to medium- term strategy to address quick wins that will have an immediate impact, as well as a longer term strategy to sustain improvement and inform other initiatives. Options for monitoring and enforcement of road construction standards. The outcomes will be shared and used across the industry to create a more uniform application of improved road construction methods and processes. BC Timber Sales: Mike McCulley, RFT; Western Forest Products: Jack Reynolds, RPF; Interfor: Robert Shelley, RPF; Ministry of Forests, Lands and Natural Resource Operations: Tom Jackson, RFT, and Gino Fournier, RPF, PEng; FPInnovations: Clayton Gillies, RPF, RPBio; BC Forest Safety Council: Dustin Meierhofer, RPF; Aztec Geoscience: Del Ferguson, PGeo; and Ponting Logging: Mark Ponting. For any additional information, please contact Clayton Gillies, Senior Scientist of FPInnovations’ Resource Roads program at clayton.gillies@fpinnovations.ca. Direct seeding in Western Canada—a reforestation alternative? Currently, most harvested land in Western Canada is reforested via natural regeneration or tree planting. Direct seeding, despite widespread acceptance in Scandinavian forestry, has not yet been widely adopted in Canada. Research efforts in the 1960-80s resulted in variable success, and as a consequence very little operational direct seeding has taken place since. However, the current reforestation challenges posed by wildfire, mountain pine beetle and salvage logging warrant the need for alternative regeneration strategies. Lack of seed source often makes these large scale disturbances unsuitable for natural regeneration and costly to plant. Furthermore, recent advances in seed application technology and knowledge have made it possible to achieve promising results, making direct seeding an alternative worth including in the silvicultural toolkit. Seeding can be done by air or ground-based equipment. FPInnovations’ research has focused on direct seeding (seeding simultaneously with mechanical site preparation) as it is particularly well suited to the large scale disturbances resulting from mountain pine beetle, salvage logging and wildfire. Direct seeding is a cost effective treatment that can cover large areas quickly, at productivities ranging from 0.6-1 ha/hr and for half the cost of tree-planting. Higher stocking densities can be easily achieved with little added cost, making it ideal for stands susceptible to forest pests. The direct seeding season is also longer than for tree planting, and can thus help streamline silvicultural operations planning. Direct seeding does have disadvantages to consider. It requires larger amounts of seed and has longer establishment time than tree planting. Germination success is dependent on uncontrollable external factors such as weather and seed predator populations. Variations in microsites can result in a clumpy and irregular distribution similar to those found in naturally regenerated stands, requiring the need for fill-planting or spacing. Successful direct seeding is dependent on knowing where and when direct seeding is a viable option, and what the best prescription is for the site. FPInnovations has installed over 13 trials across Canada since 2011 in order to assess how different ecological zones, tree species, seed treatments, treatment times, and site preparation and seeder equipment affect the end result. Preliminary operational findings have indicated that while there are a myriad of factors that influence the success of a direct seeding operation, the key factors that can be controlled are: site selection, site preparation, and sowing season. Site selection is perhaps the most important decision in the direct seeding planning process. Generally, a site well suited for natural regeneration would also be suitable for direct seeding. The site should be mesic, with low brush competition and low slash levels. Fresh, loamy soils are preferred, as coarse or fine soils can lack the soil moisture or aeration necessary for seed germination. Mineral soil exposure is required for germination in most of our conifer species. Currently available seeding equipment can be mounted on a variety of trenchers and scarifiers for a combination of mechanical site preparation and direct seeding. Direct seeding has unique site preparation requirements: trenches should be shallow and broad, best achieved with no pressure on the discs. The seedbed should be ideally comprised of the shallower soil horizons or a mix of mineral soil and humus. Direct seeding can be performed as early in the spring and as late in the fall as operationally possible. Early spring seeding with stratified seed takes advantage of spring rainfall and rising temperatures. Also, the predation risk is low because seeds will germinate soon after seeding. However, direct seeding of stratified seed has operational complications. First, care must be taken to seed early enough for the seed to become established before the hot and dry months of the summer. Second, the increased moisture content of stratified seed can cause seed flow problems in the seeder. Lastly, stratified seed is fragile and susceptible to heat, mold, and premature germination, making spring direct seeding a time-sensitive operation. These problems can be avoided by seeding unstratified seed in the late summer and fall, but having seeds overwinter increases the risk of predation by rodents. While direct seeding will not replace tree planting or natural regeneration in the future, it can be a very valuable tool for the silvicultural regeneration toolbox. The Scandinavian experience has shown that a successful direct seeding program is possible with careful site selection and seed application. FPInnovations’ research trials will add to the knowledge and experience required for achieving successful results in a western Canadian context.